Maretron’s Direct Current Monitor (DCM100) provides information about the DC electrical system. In this example the DCM100 is used to monitor the house battery bank. This comprehensive system includes an 8” touchscreen (TSM800C) for displaying information about the battery as well as triggering any associated alarms or warnings. 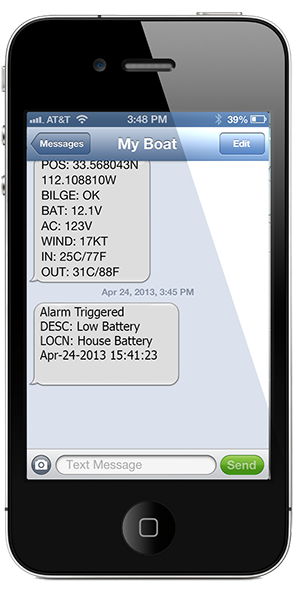 Triggered alarms or warnings can be sent off of the vessel using the texting module (SMS100), for example if the battery voltage drops too low for the bilge pumps to work. The Internet Protocol Gateway (IPG100) and WiFi router (E2500) allows the information to be viewed wirelessly on the boat using smartphones and tablets and remotely from the shore with an Internet connection. The following screenshots (click to enlarge) are examples of Alarm Text Messages you can receive when monitoring these values. 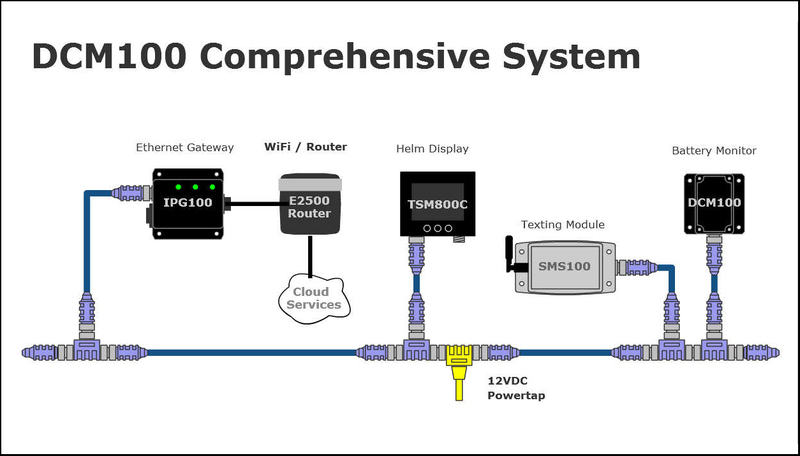 The following components (click to enlarge) are examples of how monitored data can be displayed on the TSM800C using N2KView. The components are arranged on favourite screens at positions and sizes to suit the user's needs. See N2KView web page for examples of full screenshots.